The effects of major weight loss, regardless of the methods, have positive life-altering effects that change the lives of patients forever. The beneficial effects of weight loss impact many aspects of an individual’s life. Over the last twenty years, weight loss through various surgical techniques has become an important component in the management of obesity and its related health problems. These techniques include various gastric bypass techniques as well as gastric band placement. Successful use of the these procedures have had significant health benefits to patients that include: improvements or resolution of type 2 diabetes, hypertension, heart disease, gastroesophageal reflux disease, sleep disorders, and asthma. In addition to these health improvements, studies also report significant psychological improvements and increases in quality of life. Over the last several decades, a variety of surgical procedures have been developed to treat obesity. The number of procedures being performed has increased dramatically over the last 30 years. There was a 600% increase in bariatric surgery procedures between the years of 1993 and 2003. As of 2004, approximately 144,000 bariatric procedures were performed yearly. These procedures achieve weight loss by either interfering with food absorption or by restricting the stomach’s capacity to hold food. In most cases, these procedures result in significant weight reduction (loss of 50-80% of excess weight). In the majority of patients, bariatric surgery in combination with the proper nutritional, psychological, and medical support results in successful weight loss that is long lasting. One of the most significant effects of bariatric surgery is the improvement in overall life expectancy. Type II Diabetes: Review of a large series of patients that underwent surgical weight loss procedures showed improvements in 85% of patients with Type II diabetes and complete remission in 78% of patients. Improvement or resolution of hypertension, lipid abnormalities, and other risk factors for coronary artery disease. Improvement or resolution of respiratory problems: COPD, sleep apnea, and asthma. Improvement or resolution of gastrointestinal problems: fatty liver disease and gastroesophageal reflux. Improvement in overall quality of life with respect of mobility, energy level, and emotional well-being. Several large studies have shown a lower risk of death in patients with morbid obesity that undergo surgical weight loss procedures. One large study showed an 89% reduction in mortality during a 5 year observation period following bariatric surgery as compared to obese patients who did not have surgery. Another study showed a 90% decrease in the likelihood of death due to diabetes and a 50% risk of death due to hear disease in patients undergoing surgical weight loss. Since the 1970’s, numerous surgical procedures have been developed to address morbid obesity. Weight loss through two types of surgical procedures: restrictive procedures and malabsorptive procedures. Restrictive procedures achieve weight loss by limiting the capacity of the stomach to hold food. Because of this physical restriction of the stomach size, the obese patient will achieve a sense of fullness sooner and will typically eat smaller meals. The most common restrictive weight loss operation performed today is the laparoscopic gastric band procedure. In contrast, malabsorptive procedures achieve weight loss through limiting food absorption by essentially shortening the length of intestine available to absorb nutrients. This is done by surgically rerouting the passage of food to skip or bypass the majority of the small intestine. The Roux-en-Y gastric bypass is the most common malabsorptive weight loss procedure performed today. This procedure can performed through either an open or laparoscopic technique. The adjustable band procedure involves the placement of a silicone band around the upper portion of the stomach. Using a laparoscopic technique (the use of small incisions and a camera), the band is fastened around the portion of the stomach adjacent to the esophagus creating a small stomach pouch that will serve as the reservoir for food. The band contains a small balloon that is adjustable through a port that is placed below the skin surface. Using the port, the size of the balloon can be adjusted to control the amount of food that can pass out of the small stomach pouch. The benefits of this procedure include a shortened hospital stay and postoperpative recovery with a faster return to work. Most patients achieve successful long term weight loss with a significant improvement or resolution of many of the medical problems associated with obesity. By combining the principles of reconstructive and cosmetic plastic surgery, these body shaping techniques have made significant physical and psychological improvements in patients following surgical weight loss. The Roux-en-Y gastric bypass procedure is considered the gold standard for bariatric surgery. The procedure combines gastric restriction as well as intestinal bypass to achieve weight loss. In this procedure, a small segment of stomach is excluded from the remainder of the stomach through a stapling technique. A segment of intestine is then sown directly to the stomach pouch and to an additional segment of small intestine. This effectively results in bypassing most of the intestine that is available for nutrient absorption. The operation provides as much as 70% of excess weight with long term weight maintenance and with almost 100% resolution of most obesity-related medical conditions. Although the procedure can be performed as a traditional “open” operation, it is now routinely performed through a minimally invasive laparoscopic technique by specially trained weight loss surgeons. Both of these operation are effective in long-term weight loss. Each have their advantages and disadvantages. The best way to determine which approach will best suit an individual is by the thorough evaluation of a General Surgeon specifically trained in weight loss surgery. Dr. Zemmel works with a number of excellent General Surgeons and will refer you to the proper specialist. Despite the tremendous positive benefits of weight loss surgery, and regardless of the technique, the changes that come with massive weight loss leave patients with significant body wide changes. Often, profound and unpredictable changes in body shape occur in conjunction with weight loss. Patients develop significant collections of skin in the abdomen, breasts, arms, and legs. Loose skin rolls of the chest, back, and abdomen can be associated with physiologic problems such as recurrent rashes and limitations of physical activities, and chronic pain. In addition to these physical changes, these unexpected changes to physical appearance may have psychological implications that affect an individual’s self-confidence and overall psyche. The advent of various techniques of surgical weight loss has resulted in the development and the refinement of techniques in body recontouring. Dr. Zemmel, surgeon at Richmond Aesthetic Surgery in Richmond, Virginia has extensive training and experience in body recontouring following weight loss. He is eager to assist you in completing your weight loss journey. How much weight did you lose and over what time period? How long have you been at your current weight? If not, how close are you? What medical problems did you have before losing weight? Do they persist and, if so, are they improved? What are your activity levels? What fitness activities are you involved with? What is your overall nutritional status like? What corrections to your body shape would you like to make? What physical difficulties or symptoms do you have associated with your body shape? How do you expect to look after surgical recontouring? Will you accept potentially visible scars in order to achieve improved shape? Ideal candidates for body contouring have reached or are relatively close to their ideal weight and have maintained it for at least 6 months. They have adopted a lifestyle that includes good nutrition and regular exercise/activity. They are “in a good place” psychologically, and they have realistic expectations for their surgical outcomes. A comprehensive evaluation by Board Certified Plastic Surgeon Dr. Neil J. Zemmel, who is experienced in body reshaping following major weight loss, is the best way to determine if you are ready to take the next step in your weight loss journey. A combination of surgical techniques are involved in achieving an individual’s goal for body reshaping after major weight loss. The surgical plan typically involves a combination of excisional techniques and liposuction. It is important to remember that the surgical plan and techniques involved are dependent on the concerns and problems that are unique to you as an individual patient. Because patterns of weight loss differ between individuals, there is not a “one size fits all” approach to body reshaping following weight loss. 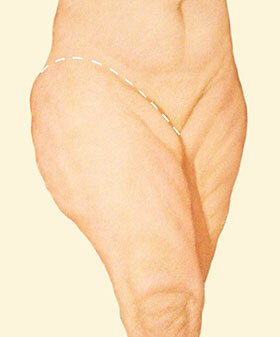 As a result, incision patterns will be determined by the unique concerns of a patient, and they will vary from individual to individual. Based on their comprehensive evaluation, Dr. Zemmel will develop a surgical plan that is tailored to address your concerns. In women, correction of these issues typically involve a variety of breast reduction or lifting techniques. Often times a breast implant may need to be placed in order to restore volume. In men, the correction involves the techniques used in gynecomastia surgery which is usually a combination of liposuction and excisional techniques. Additionally, soft tissue rolls along the chest and back can be addressed through excision of the excess skin, resulting in thin scars which will extend along the chest wall to the back or into the under arm area. These lifting techniques are sometimes called an upper body lift. The exact positioning of such incisions will be dictated by the nature and location of the skin excess. 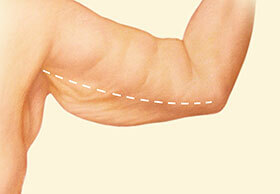 One of the most common changes that occurs following major weight loss is significant laxity of the arms. Most often it is characterized by skin laxity that “hangs” off of the upper arm when the arms are raised level to the shoulder. Although exercise will improve underlying muscle tone and strength, the loss of elasticity of the skin and soft tissue covering the muscle obscures any improvements in muscle tone and definition. In most patients surgical contouring is the best way to achieve improvements. 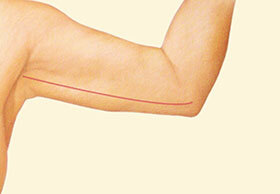 Surgical recontouring of the arms is achieved through a procedure called a brachioplasty. In this procedure, a pattern of incisions are designed in a manner in which the excess skin is removed, and the overall skin envelope is tightened. In some cases, the incisions can be hidden in the crease of the underarm. In most cases, recontouring is achieved by an incision that parallels the groove on the inner aspect of the upper arm parallel or just below the groove adjacent to the biceps muscle. It is important for patients to understand that although all attempts are made to minimize the scar, the scar will be visible in short sleeve or sleeveless garments. Learn more about arm lifts. Weight-loss related changes to the abdomen and mid-section are, perhaps, the most common reasons patients seek surgical correction. There are a number of procedures that can address the changes. The comprehensive and detailed evaluation of body shape and skin integrity following weight loss guides the surgical plan to achieve transformation. During your consultation Dr. Zemmel will perform a comprehensive examination to review your unique body shape, and a unique treatment plan will be formulated to achieve your goals and desires. In recontouring the midsection, Dr. Zemmel will pay particular attention to the locations of abdominal skin excess and the overall distribution of abdominal fat. Following massive weight loss, patients often develop a large apron of skin (a panniculus or pannus) that frequently overhangs the pubic area. Often this skin flap is associated with recurrent rashes, low back pain, and a limitation of overall mobility. The weight associated with this skin flap often restricts a patient’s ability to perform routine daily activities and to maintain a regular exercise program. A panniculectomy is a surgical procedure that is designed to remove this large flap of skin that hangs over the pubic area. To accomplish this, a series of incisions are made that follows the lower abdominal skin fold and that include the overhanging skin flap. Once the flap is removed, the incisions are then closed, resulting in a scar that gently curves from hip to hip. It is important to remember that the panniculectomy removes loose skin and fat that is mostly located below the umbilicus (belly button). It is an operation that provides relief of recurrent rashes, back pain, and limitations of mobility. Because of its functional benefits, a panniculectomy is frequently covered by many medical insurance companies. Dr. Zemmel will assist you in obtaining authorization for this procedure. Following a panniculectomy, patients can anticipate a 1-2 day stay in the hospital prior to returning home. Complications of panniculectomy are similar to those of abdominoplasty and include: bleeding, infection, delayed wound healing, postoperative fluid collection (seroma), asymmetries, and need for additional procedures. Please schedule consultation with Dr. Zemmel if you are considering panniculectomy surgery. The abdominoplasty or “tummy tuck” is useful in addressing skin laxity limited to the front of the abdomen. In contrast to the panniculectomy, an abdominoplasty can address skin laxity above and below the umbilicus (belly button). Recontouring is achieved through an incision placed low on the abdominal wall that follows the shape of the lower abdominal skin fold. In most major weight loss patients it usually extends across the length of the abdomen. There is also an incision that encircles the belly button. The skin of the abdomen is lifted and the muscle layer beneath is examined. In most patients the muscle layer demonstrates some laxity and is tightened. Hernias also may be found and are repaired at the same time. Abdominoplasty may be performed alone or in conjunction with a procedure addressing the back of the trunk. If a procedure on the back is performed the front and back incisions are joined together to make one circumferential incision. In certain cases, the abdominoplasty incision pattern can be modified to address significant laxity of the upper abdomen. A “fleur de lis” incision pattern is a modification that involves extension of a midline vertical incision to the normal lower abdominal horizontal incision, resulting in a T-shaped scar. The Fleur de lis abdominoplasty is especially useful in patients that have undergone traditional open gastric bypass and that have an upper abdominal midline scar. It is also a useful approach in patients that require a hernia repair in addition to removal of excess skin and fat. In these cases, Dr. Zemmel can work in conjunction with a general surgeon to coordinate an abdominoplasty or panniculectomy at the time of a hernia repair. In certain cases, panniculectomy and occasionally abdominoplasty procedures will be covered by some medical insurance companies. Insurance carriers usually have specific criteria that must be met to qualify for coverage. These include: a skin flap that hangs below the pubic bone, associated medical conditions such as recurrent skin infections and rashes, and, in some cases, weight loss greater than 100lbs. Another important consideration is whether a particular insurance plan will cover these procedures. While covering most routine medical and surgical care, some employer-based medical insurance plans do not cover panniculectomy or abdominoplasty procedures. The staff at Richmond Aesthetic Surgery can assist in determining whether your plan offers these particular services. If you think you may be a candidate for abdominal reshaping following weight loss, contact Richmond Aesthetic Surgery to schedule a consultation with Dr. Zemmel. The belt lipectomy is a procedure that can address skin laxity that extends circumferentially around the lower portion of the abdomen to the back. In this procedure, the basic lower abdominal incision of an abdominoplasty is extended around to the back, following the natural curves of the hips and buttocks. Through this circumferential incision pattern, loose skin of the abdomen as well as the back can be removed for recontouring of the entire lower trunk. To accomplish recontouring of the lower back and abdomen, a patient first undergoes the tummy tuck portion of the procedure. While asleep, the patient is then placed on his or her side. The hip and back incisions are made, and the excess skin of the hip rolls and lower back is removed. The patient is then repositioned to expose the opposite side, and the excision is completed. Learn more about body lifts. Patients lose weight in a variety of patterns that are influenced by factors such as genetics and pre-weight loss body composition. Some patients exhibit more physical effects of weight loss in the hips and legs, rather than the abdomen. In these patients, a variety of lifting techniques can be performed to recontour the legs and hips. Laxity of the medial (inner) thighs often appears as soft tissue rolls that hang in the medial thigh. At times, there can be multiple soft tissue rolls that hang over the inner portion of the knee. A medial thigh lift is a surgical procedure designed to address excess tissue of the medial thigh. The types of incisions that are used are dependent on the degree of soft tissue laxity. In some cases, the incisions can be hidden in the crease of the groin of the thigh. In many cases, however, an incision extending from the inner thigh down to the knee is necessary to adequately recontour the medial thigh. The thigh lift operation consists of removal of excess skin and fatty tissue from the inner thigh area. After tissue removal, the entire incision is closed with absorbable sutures and tissue glue. In most cases a drain tube is place under the skin to remove tissue fluid that may accumulate in the days after surgery. In most cases, the drain is removed one week after surgery in the office. Learn more about thigh lifts. In certain cases, significant laxity of the lateral thighs (saddle bag area) as well as the lower abdomen and back can be treated with a lower body lift. This operation uses similar incisions and surgical steps as a belt lipectomy. In contrast to a belt lipectomy, the lower body lift can achieve additional lift along the lateral thighs through additional surgical steps that are not routinely part of the belt lipectomy. For more information on gastric bypass reconstruction, or to schedule a consultation to talk more about your options, please contact Richmond Aesthetic Surgery today.